What is important in life? Figuring that out what is a good habit to get into. In the busyness of life, you will never be able to get done all that you have on your “to do” list. So the challenge that we have is to decide what is really important and put the majority of our time and effort into these pursuits. As you can read in this article from NFLplayerengagement.com, Denver Broncos tight End Jacob Tammeoffers the same advice to student athletes and pro athletes. Figure out what’s important, your life will reflect the things you put as priorities. For Tamme, his priorities are, in order, faith, family and football. In the interview, you can read that although football is a consuming part of his life, and something that he loves a great deal, Tamme’s relationship with God and his family take priority over his career. He was the winner of the 2007 Fellowship of Christian Athletes Bobby Bowden Award. You can also check out his foundation at this link. 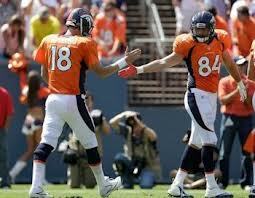 Tamme is in his 5th NFL season, and first with the Broncos. He signed there shortly after Peyton Manning arrived – the two played together for in Indianapolis. After playing through a hard year last year (starting the season with 13 straight losses in Indianapolis) he said that his faith and his family were there to help him deal with the disappointment of that season. In good times, there are lots of people around to celebrate with, but in hard times, without a good foundation of faith and support, we can feel alone. We see that in the story of the Prodigal Son, and we experience it often in our life. Our hope is in Christ alone. So what is important? I’m forcing myself to ask that question often these days. There is always so much to do, and so many ways to occupy myself. I need to prioritize so that the stuff that needs to get done the most, gets done. It is an important question to ask at this time of the year, too. The Christmas season comes with so many activities and “things to do” that it is easy to overdo it. It is also easy to lose sight of the true meaning of the Christmas season. We celebrate the birth of the Savior. Because of his life, we have hope for eternity with God in a place more amazing than we can imagine. That is reason to celebrate! But it is a challenge to keep that as our focus during the busyness of the season. Let’s keep in mind the reason that we celebrate Christmas. Jesus is the gift that betters our life right now, and sees that our life will go on with God forever.